The trauma of dirty loos could be a thing of the past for users of pPod, a guide to the best and worst of public toilets for iPod owners. 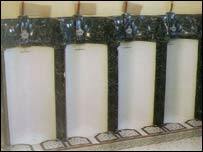 The possibility of unpleasant odours, a lack of soap or paper, graffiti and absent attendants have the power to strike fear into the hearts of all but the sturdiest of visitors to public toilets. The question of whether to hold on until a familiar, clean facility is reached, or to bite the bullet and gain immediate relief, is one which faces everyone at some point. A possible solution is now being offered to iPod users, who could soon have the power to choose their loos with confidence. A free interactive guide to public conveniences, appropriately called pPod, offers audio and text information on their whereabouts, opening hours, facilities and cleanliness. At present pPod users have access to 114 reviews of central London toilets, but its creators, Nykris, say it could be extended to other cities. Company employees were sent out across the city to record their thoughts on the state of the capital's loos. The happiest reviewer took a trip to Hyde Park and reported: "Plenty of hand washing facilities, lovely clean mirrors, each of the cubicles look very clean indeed and they've all got toilet paper. "Fantastic. I can't fault it. Maybe it's because it's quite close to one of the Royal parks?" Nykris managing director Philip Read adds: "The definite lowlight was Piccadilly Circus, which at lunchtime on the Wednesday we visited was closed." Some of the 14 audio reviews come with accompanying sound tracks, including Handel's Water Music. 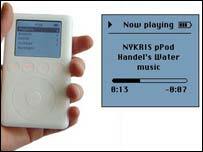 The pPod makes use of the iPod's text facilities which, Mr Read says, are "under-exploited". "It does audio extremely well, but given that it has a screen and it's easy to make interactive experiences with that, nobody really seems to be making the most of it." Users download the program to their PC or Mac, and then put it on their iPod. They can search through areas alphabetically, and then access the text and audio entries from there. "We're currently exploring other iPod-based services that could be developed, including an interactive audio guide to gigs and clubs - something that we think could be particularly attractive to iPod fans," said Mr Read.